“Grand Budapest” Upsets Ahead at Golden Globes! Expect there to be multiple upsets at the Golden Globes tomorrow night (is it time for the Golden Globs already?!?). With the ELEVEN astounding BAFTA nominations under its’ flashy, bejeweled belt “The Grand Budapest Hotel” could very well win not only Best Screenplay for its writer/director Wes Anderson, but also win in their Best Musical/Comedy category for Best Picture! Yes! It could. These are the Hollywood FOREIGN Press after all remember who give out this award. And don’t be surprised if Ralph Fiennes also nominated for “Budapest” wins Best Actor over favorite Michael Keaton again in the Musical/Comedy category which they are both in.. It could happen. “Grand Budapest Hotel” is a runaway train at this point. A runaway AWARDS train! The Absolutely Grand “Grand Budapest Hotel”! A screwball comedy with real screwballs! How often does a WITTY comedy open these blockbuster days and become a record-breaking box-office blockbuster itself? Unheard of! Astounding! 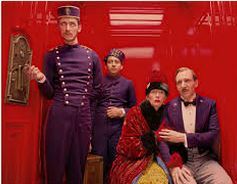 When everything is a comic book or a sequel that makes me gag, “The Grand Budapest Hotel” towers above all others in laughs, style and brain-i-ness, and oh yes, all the good guys are inexplicably wearing moustaches and Tilda Swinton is an 84 (or is it 83? )-year-old love interest to Ralph Fiennes’ sublime comic creation M. Gustav H.
A screwball comedy with really screwballs! Divine! And Madame Tilda’s murder sets in motion a dense plot of A-listers-in-cameos all fighting over the dead woman’s money. And of course, she’s left it all to M.Gustav, and of course, hilarity ensues. The cast is a who’s who of International Hollywood starting with Ralph Fiennes himself giving the performance of his career, comically speaking. Who knew he had this kind of expert comic timing in him? Anderson’s lines are putting it mildly often tongue-twisters and that fine actor Fiennes is having a fine time getting them all out in that perfect British upper crust accent and hitting the ball out of the proverbial comic park every time. And Swinton has never been better, or should I say, never been funnier. I always felt she had a penchant for British drawing-room comedy that has never been tapped. Until now. She’s hilarious! And a new discovery as the perennial Anderson innocent Zero, Tony Revolori of Anaheim, California holds his own against Fiennes and Swinton and Jeff Goldblum and Willem Dafoe and Bill Murray, as he romances Agatha, a kitchen maid played beguilingly by Irish actress Soairse Ronan, who has a large disfiguring birth mark on one side of her face, in that shape of Mexico. This, in pure Anderson style, is never even referred to. It’s just THERE. One side of her face is perfectly classically beautiful and the other side is just well, beautiful, too, because she is. The film for all of you dear readers, dear cineastes, is in three different aspect ratios, which are too complicated to explain here and spoil all the egg-headed fun as “Grand Budapest Hotel” keeps flash-ing backwards in time from the not-so-grand semi-now, Tom Wilkenson narrates, to F. Murray Abraham, who now is Mister Moustafa and OWNS the “Grand Budapest Hotel”. A journalistic Jude Law asks him how he got it, and as Abraham explicates, we jump back in time again, and it turns out he is Zero, the Lobby Boy, we’re going to be spending a lot of time with as does Ralph Fiennes’ M. Gustav. For M.Gustav takes on the hapless Zero, who has to draw HIS moustache in with a dark pencil, as his protegee and partner in crime, as they try to well, you have to see the film. All the villains in the film, like Dafoe, are strangely clean-shaven. Only good guys have moustaches. I will spoil no further. But suffice it to say that it’s Anderson’s best film by far, and he’s now launched himself into the cinematic stratosphere of THIS year’s Oscar race, which will garner nominations across the board. The visuals being as sumptuous as the acting is delicious. I can’t wait to see it again! Let the Oscar conversations begin! And the often nominated, but never awarded composer Alexander Desplat, may very well be getting his first Oscar here for his hilarious score keeps the hi-jinks high. The number of A-list stars director Anderson has pulled into to flash by in the smallest of parts, like, as I said, Academy Award-winner Tilda Swinton, as the grand octogenarian Madame, who Gustav is romancing. Her every tremble is a delight, and who is suddenly found dead. Teen Stars Saoirse Ronan & Tony Revolori Rock “The Grand Budapest Hotel” with laughs! Academy Award nominee Saoirse Ronan is all grown up now in the hilarious heist romp “The Grand Budapest Hotel” and she is joined in merriment with Tony Revolori who aces the leading role of “Lobby Boy” Zero! Enjoy! 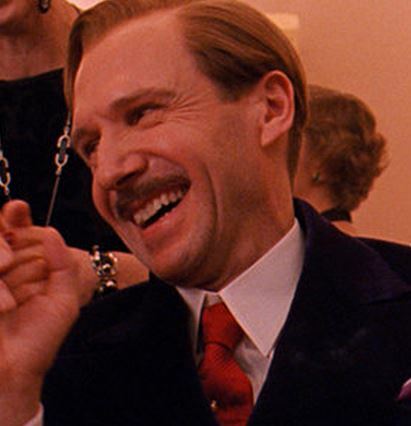 Ralph Fiennes is Smashing in the new “Grand Budapest Hotel”! The great Ralph Fiennes is in magnificent form as the sly conceierge at “The Grand Budapest Hotel” which is a comic delight and my favorite Wes Anderson film to date. Ralph just shines, shines, shines in it as Monsieur Gustav, who has got be be one of his greatest roles to date, certainly in an out-and-out comedy! He’s delightful! And so is the whole marvelously baroque movie around him!